I'm a fan of hip-hop. I'm also a fan of cats. As it turns out, I'm also a fan of cat-rap. 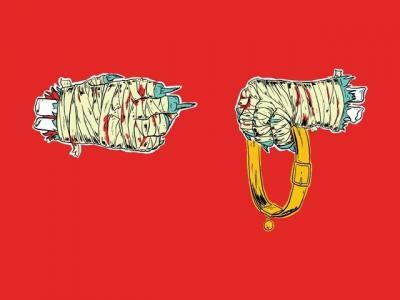 That's not a lede I ever expected to write, but thanks to Meow The Jewels, the wonderfully bizzare remix of Run The Jewels' excellent second album, it's a reality. The whole idea started off as a joke, but enough people thought the prospect of having Run The Jewels 2 remixed entirely with cat sounds and the original album vocals was just too good to pass up. Over $40,000 was raised last year in support of MTJ, and roughly a year later, it's finally here. And you know what? It's actually pretty damn good. Seriously, RTJ and a superstar squad of gust producers made the whole thing work in gloriously goofy fashion. It's an absolute blast, especially when you commit to just how wonderfully stupid the whole idea is, and some of these tracks hit hard. Opener "Meowpurrdy" is a genuine banger of a track, which is impressive given that the bass is comprised of meows and hisses. MTJ is an exercise in ridiculousness, but there are some genuinely intriguing elements to it, particularly when it comes to how these damn cat sounds actually change the whole mood of a song. Blood Diamonds' remix of "All Due Respect" (entitled "Paw Due Respect" because cat puns are great) takes the high-energy origional and gives it a much more relaxed vibe, which is fascinating for someone who's used to blasting these songs on the highway. The bonus version of "Creown," remixed by 3d of Massive Attack, employs a propulsive purr bass (another phrase I never expected to type), to give the original a whole new twist. Yeah, not everything on MTJ is quite as interesting and sometimes downright goofy, but this is a freaking cat-rap album. Goofy is the name of the game. I'm just shocked - and pleased - that MTJ is better than I would have ever expected it to be. Check it out on Spotify or download the album for free on RTJ's website. Now Hear This is a regular column in which Associate Editor Alex Bieler writes about music - both new and old - that he thinks you should introduce to your ears. If you've know an album that you think he should highlight, shoot him an email at abieler@eriereader.com or Tweet at him at @Catch20Q.